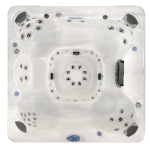 Not only are the hot tubs in the Vita Spa 500 series packed full of features, the build quality is unparalleled in this price bracket (and better than most higher-priced hot tubs too!). Vita Spa has focussed on longevity and quality, that’s why instead of the industry standard wooden frame, Vita Spa 500 series hot tubs have a appliance-grade steel frame which will never rot, warp, split or crack and is 40% lighter. We’re so confident in the frame we offer a lifetime steel structure warranty.All our 500 series hot tubs (except the Trio) have an MP3 surround sound stereo system with 2 Shell Speakers and Sub Woofer as standard; you won’t believe the sound quality until you hear it! As with all Vita Spa hot tubs, this range features the award winning Bluemaax insulation for outstanding heat retention properties, they also have an ABS sealed pan base to lock in heat and seal out moisture. The 500 series cabinets are made from a high impact composite, Excel-Xtm which looks and feels like real natural wood but without the numerous drawbacks. As with all Vita Spa hot tubs, the 500 series has Balboa controls.